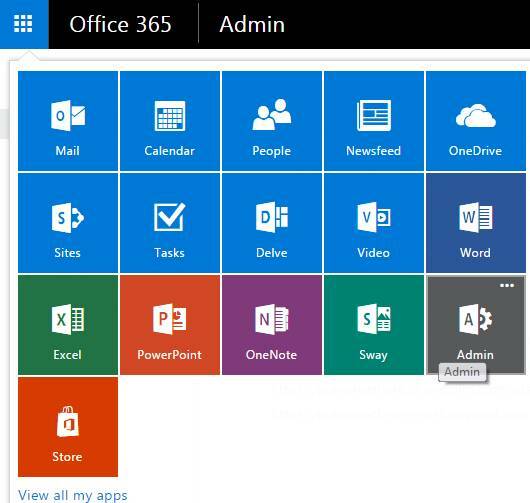 Welcome to an article on how to Manage Organization Properties under User Profiles at the SharePoint Admin Center on Office 365. Sharing has always been an important part of SharePoint. 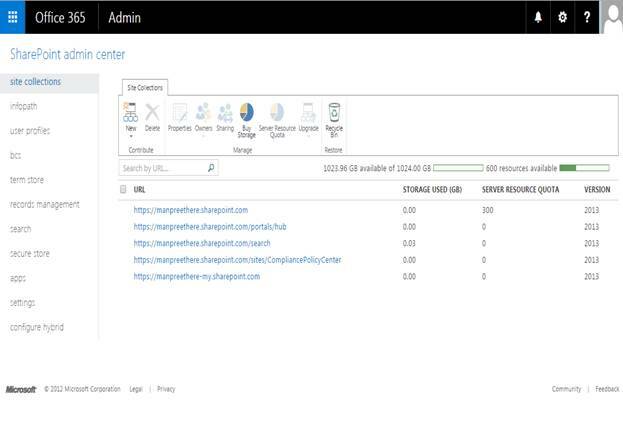 Here in this article, we will see what are the options available for us to Manage Organization Properties of User Profiles at the SharePoint Admin Center. 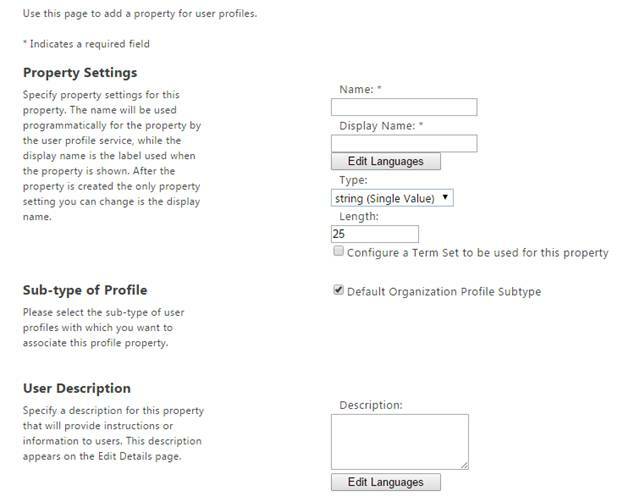 You can use this section to update or modify Organization profile properties within your SharePoint hub. Let’s see what it got. Starting off from the first option, use this page to add a property for Organization profiles. Here you can provide a name and display name to your property. a. Edit Languages: You can define in which language you have to set the property. b. Type: You choose the type from a variety of list here. c. Length: You can choose the length of the name of your property. d. Configure a Term Set to be used for this property: Here you can choose a term set to be used by this property. Here you can select the sub-type of Organizational profiles with which you want to associate this profile property; for us it is default. Provide a description for the users to know their property and you can choose Edit Languages to assign a language. You can specify the policy settings here to your property. a. You can either make it as Required, Optional or Disabled. b. You can either set it Me or for everyone. c. You can also set if the property can be override or replicable. You can define whether you want to allow this property to be edited by other users. Display Settings: You can select among the options below to display the settings. You can choose whether you want this profile property to be displayed on the user’s profile page. You can choose whether you want this profile property to be displayed on the user’s edit details page. 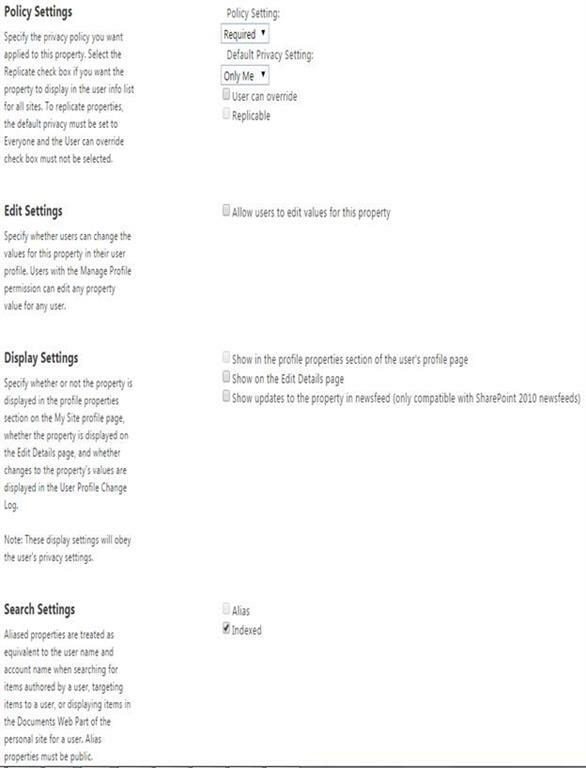 You can choose whether you want to show updates to the property in newsfeed only available in SP 2010. You can choose how you want to use search as in alias or indexed. 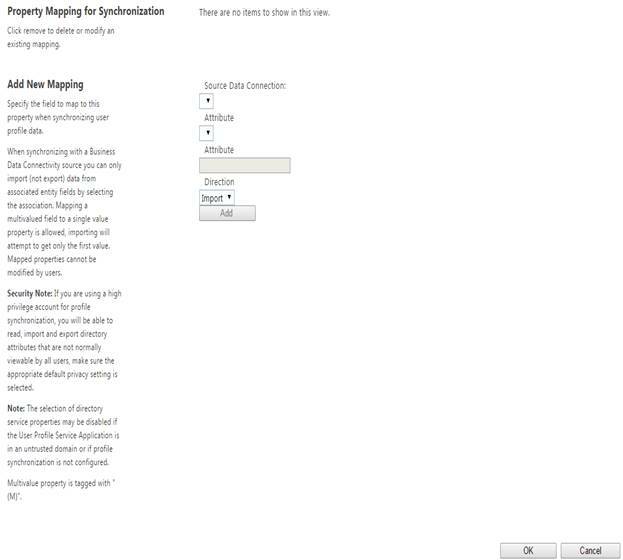 You can specify the field to map to this property using synchronizing. Here you can use this to create new section. Here you can provide the name and display name for your section. Please select the sub-type of organization profile which you want to add along your section. 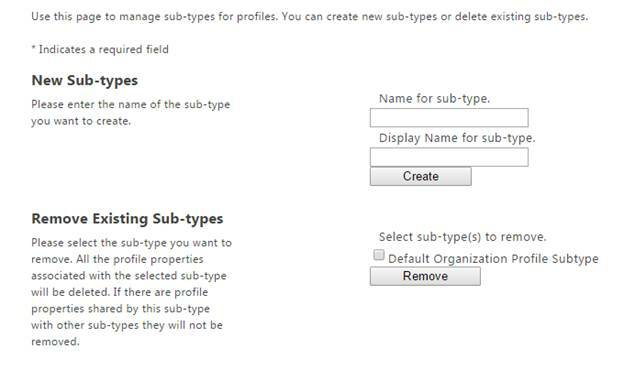 Use this page to manage sub types for profiles. Provide a name to create sub types by providing a name and the display name for sub- type. Here you can choose to remove the existing sub types. Once you have sub types, you will be able to view them here and you can choose it from this drop down. 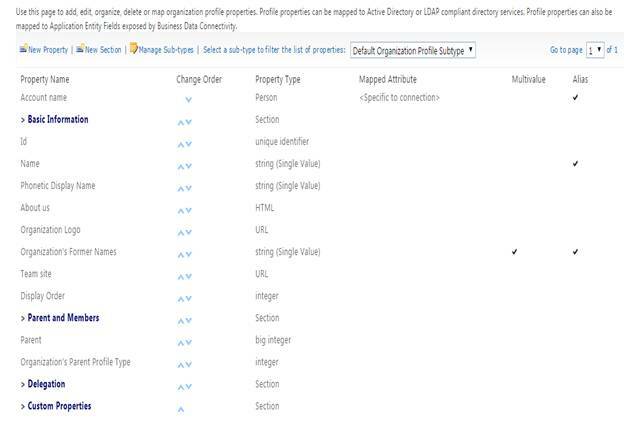 Here in this article we learned how to Manage Organization Properties under User Profiles at the SharePoint Admin Center on Office 365.